Girard-Perregaux will be celebrating its 225th anniversary this year, which makes it one of the oldest watch companies still in operation today. Together with this special anniversary, Girard-Perregaux is updating its Laureato collection with the new Girard-Perregaux Laureato 2016 watch. 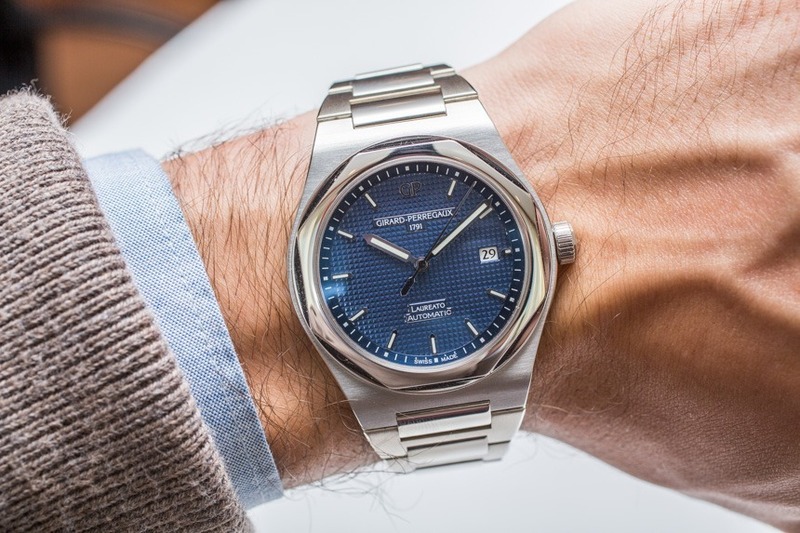 Interestingly, the last major update to the Laureato was in 2003 with the Laureato Evo 3, which had an enlarged 44mm case and a new bracelet, so it really has been a long time coming. What’s new about this watch? 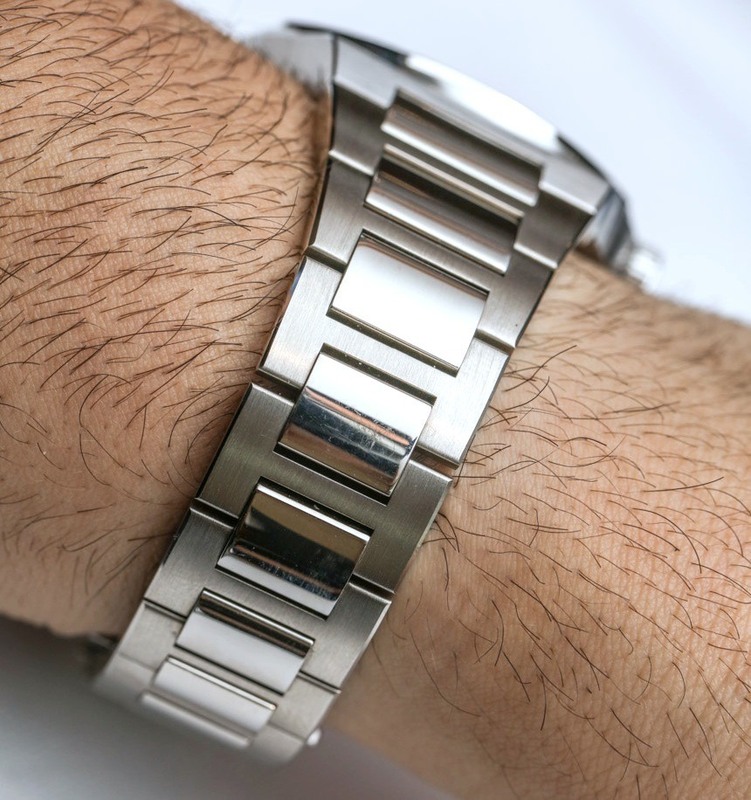 Read on to find out; but first, a little history into the Laureato. 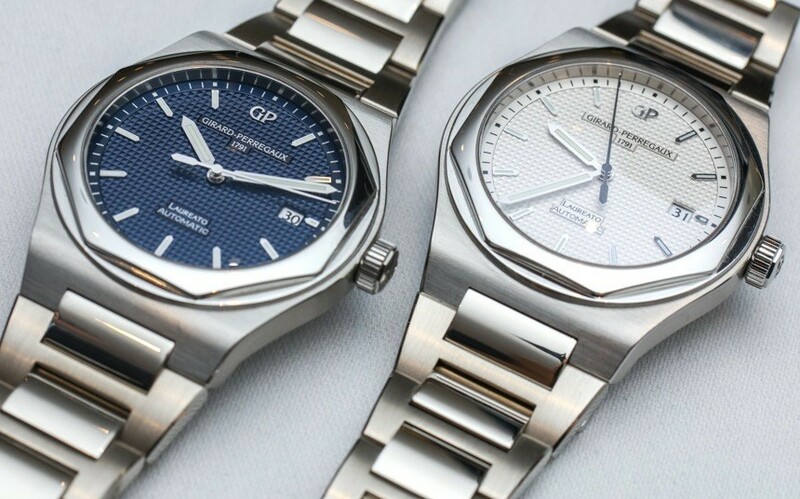 The Girard-Perregaux Laureato collection was born in 1975, at a time when sportier looking high-end steel watches were beginning to become popular thanks to the Royal Oak, which was created three years earlier in 1972. 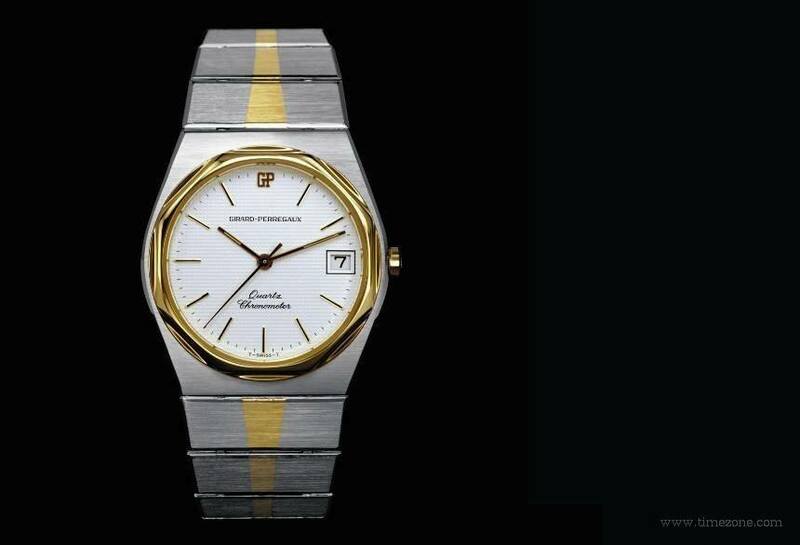 The Laureato of 1975 had an integrated bracelet and a polished octagonal bezel – not entirely unique features for the time – but what really made the 1975 Laureato stand out was that it was to be a showcase piece for Girard-Perregaux’s technological prowess, and it was outfitted with an in-house made quartz movement. 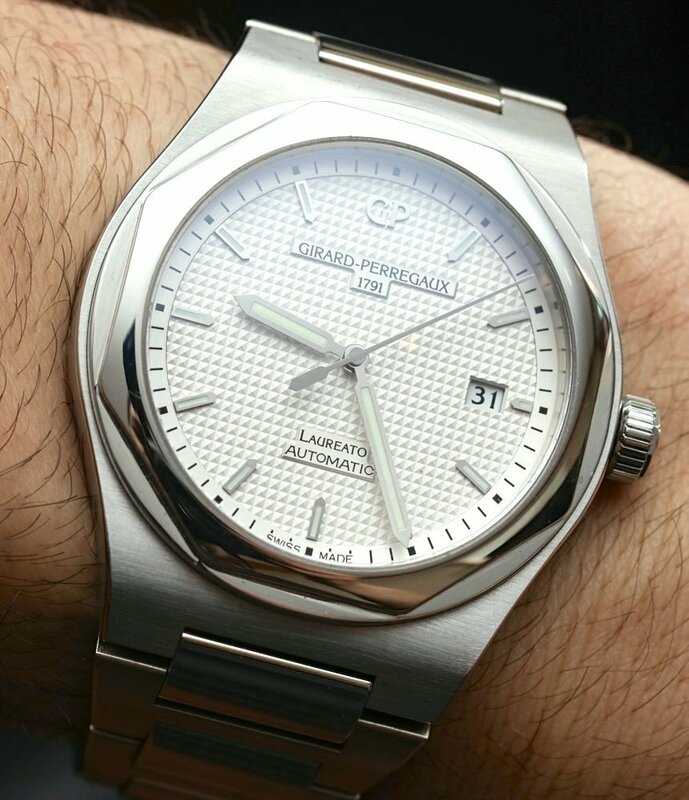 The name Laureato is also interesting, as it was suggested by Girard-Perregaux’s then-Italian distributor, who was inspired by the classic movie, The Graduate, which, in Italian, was Il Laureato. 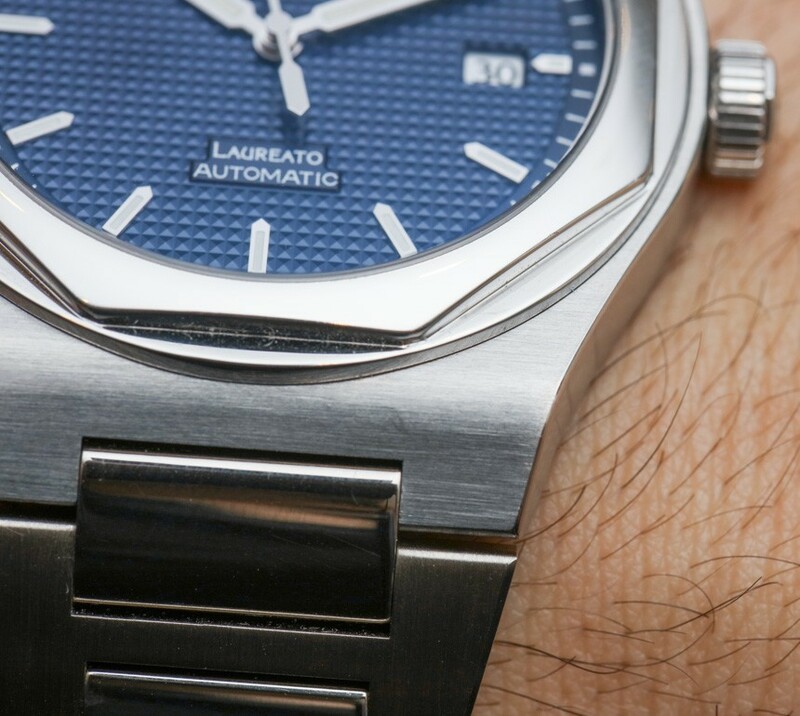 It is said that, because of this, many Italian parents bought Laureato watches for their children when they graduated from school. 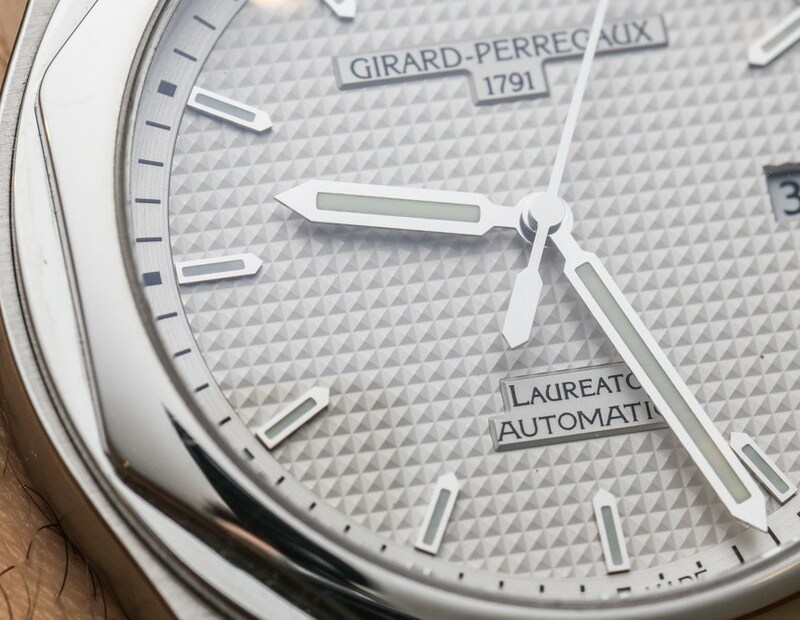 For the new Girard-Perregaux Laureato 2016, Girard-Perregaux is returning to their roots. Instead of an evolution of the sporty Laureato Evo 3, the Girard-Perregaux Laureato 2016 comes in a more modest case and is significantly more restrained, classic, and elegant in its looks. 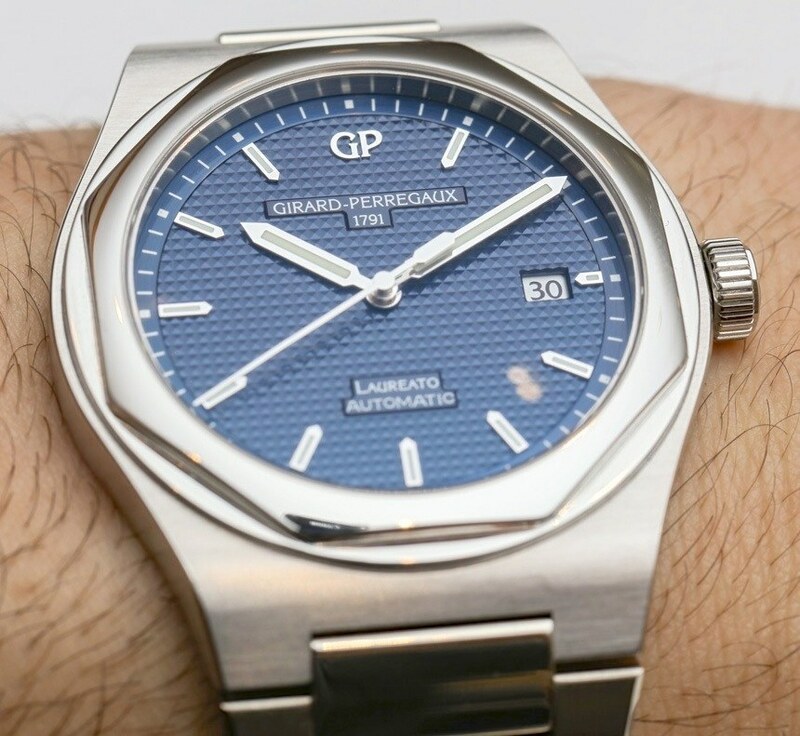 The latest Girard-Perregaux Laureato comes in a 41mm case and is just 10mm thick. And like the original model from 41 years ago, the first thing that grabs you about this watch is its strong and well-finished case. The octagonal bezel is mirror polished and gleams brightly under direct light. Its construction is interesting because it breaks into a ring at the base where it meets the case. 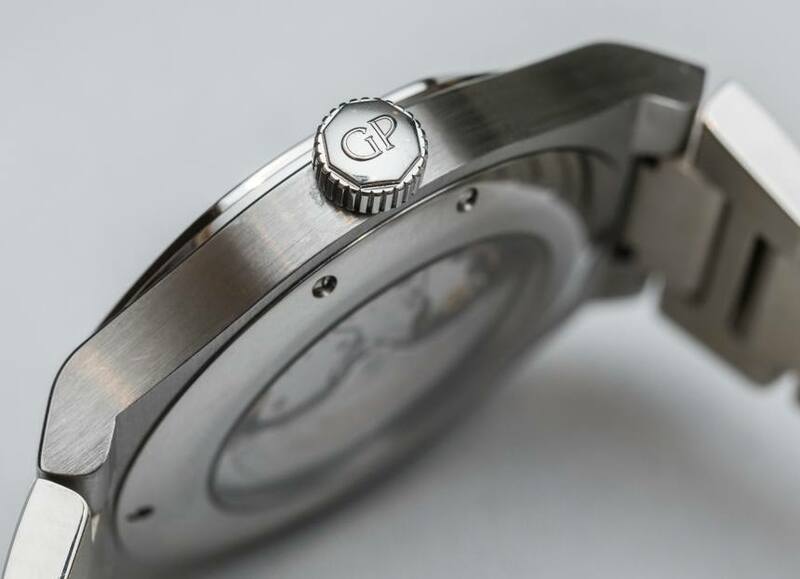 The case is largely satin-brushed, which offers a great visual contrast to the smartly polished bezel. 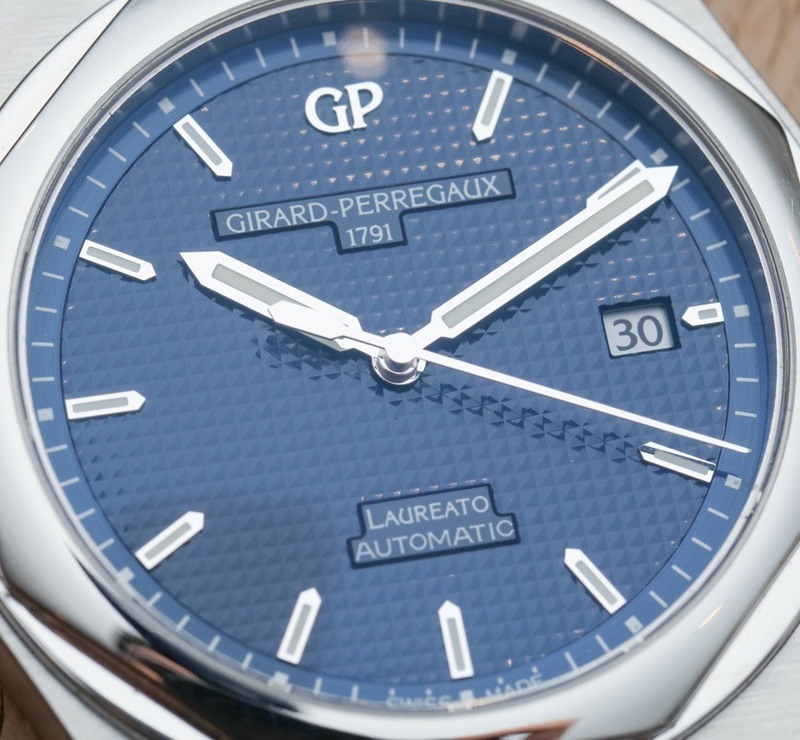 The Girard-Perregaux Laureato 2016 will be offered with a blue or white dial, and both dials will be stamped with Clous de Paris patterns. Depending on the angle at which light falls on the watch, the dial can take on numerous shades. 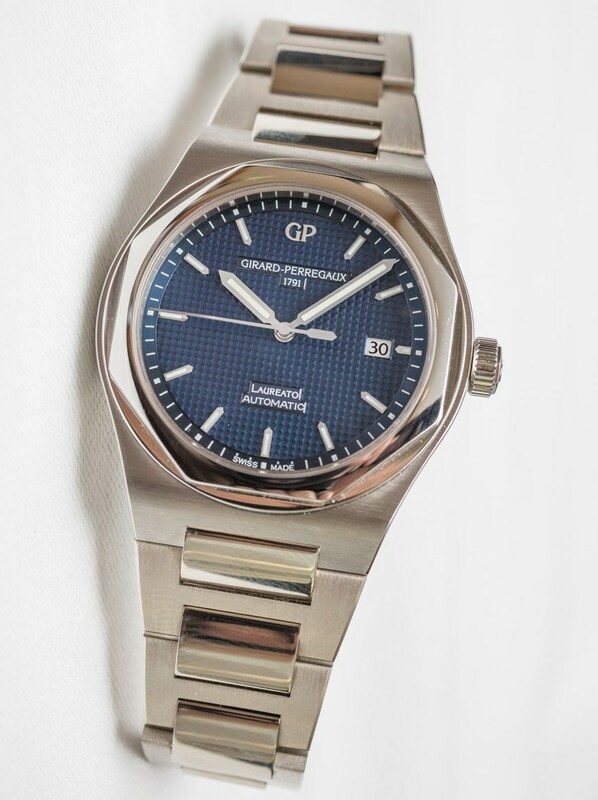 For example, under direct light, the blue dial variant of the Girard-Perregaux Laureato 2016 appears as a brilliant and shimmering shade of blue; but under shade, it turns dark and looks almost black. This color-changing “ability” of dials (and in some more rare instances other components) is one of the cooler and more timelessly fascinating techniques watchmakers use to make a piece look more visually interesting – and to keep things that way over a longer period of time. For the white dial variant, it looks silvery under direct light and turns creamy when under a shade. Another design element to note here is that the Clous de Paris pattern only extends up to the hour markers. The chapter ring for the minute markers is slightly raised and in an ever so slightly different shade of its respective dial color. The applied indices, the recessed brand logo at 12, and model name at 6 help add some extra depth to the dial – with that said, a no-date alternative that allowed the hobnail pattern to really extend all across the dial would have been nice to have. Decently sized baton-shaped hands inspired by the 1975 version ensure that legibility isn’t too much of an issue. The blue-dial variant is obviously the easier of the two to read, but the white dial one isn’t too bad either – and definitely better in real life than images would suggest. 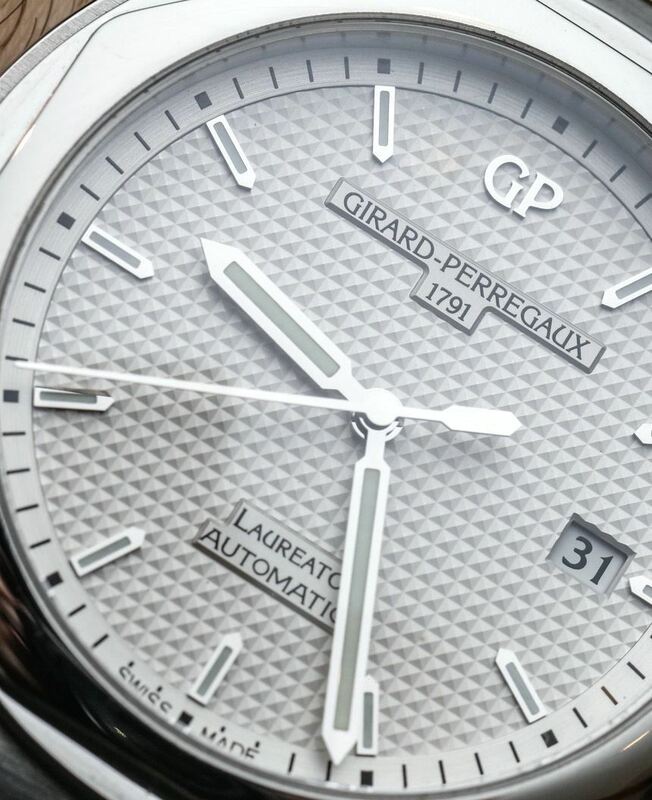 Lovers of the original version will also be pleased that Girard-Perregaux has put the GP logo back in its place, replacing the baton marker at 12 o’clock. Last but not least, the hands and hour markers are all filled with luminescent material. 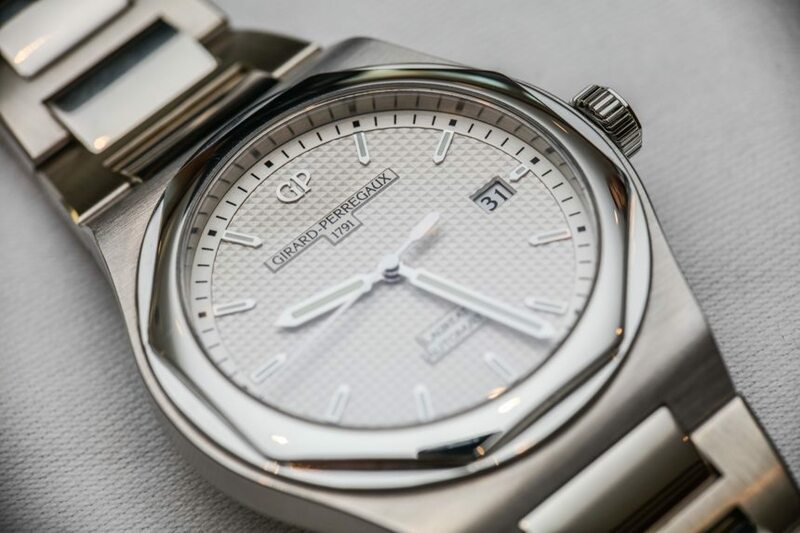 All in all, the Girard Perregaux has scaled the Laureato back in a rather tasteful, and yet convincingly not too conservative way – the proportions of the case, bezel and dial appear to be spot on, which may seem to be a given thing, but is actually a difficult feat to pull off. In keeping with the heritage of the Laureato collection, the new Girard-Perregaux Laureato 2016 also has an integrated H-bracelet that features a mix of mirror polishing and satin brushing. It also has a very discreet butterfly clasp which is easy to operate and doesn’t break up the look of the bracelet. The movement within the Girard-Perregaux Laureato 2016 is Girard-Perregaux’s in-house caliber GP03300-0030. It’s a 27-jewel automatic movement that beats at 28,800 bph and has a power reserve of 46 hours. 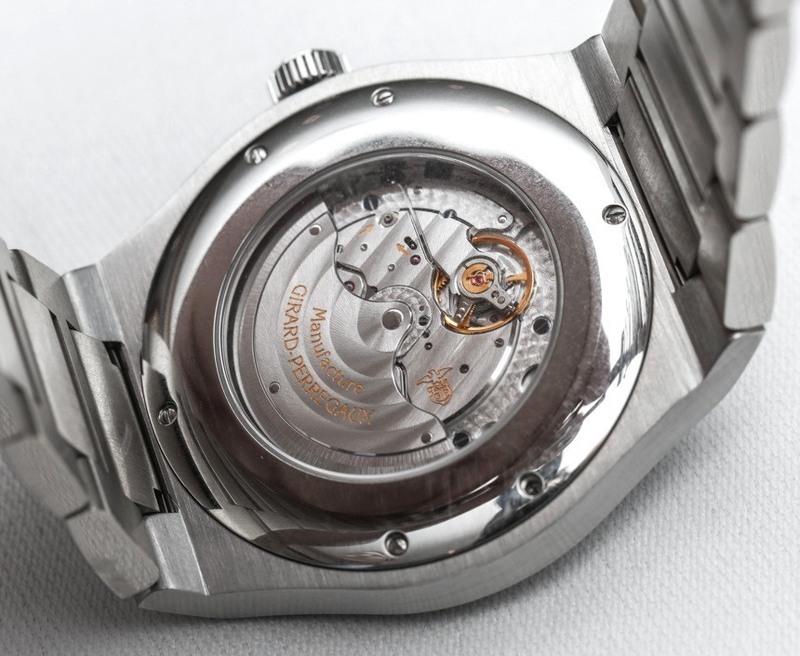 While this time-only caliber is nothing particularly crazy-looking, the sapphire caseback still allows owners to view the extensively decorated winding rotor and movement plates.